Pilot Balloon suits respiratory and tracheal kits. 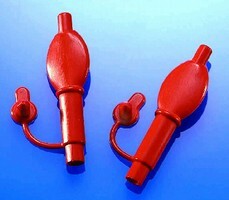 Red Pilot Balloon with Plug, Model 13499 is comprised of 2Â¼ in. long silicone balloon with 0.100 in. inner diameter to accept most inflation tubing. Port with plug has 0.158 in. inner diameter. Balloon is brightly colored and can be distinguished from other components. Edgewood, N.Y., October 4, 2005 - Qosina is pleased to add an additional pilot balloon to our current inventory. The red pilot balloon with plug - part # 13499 is a component in respiratory and tracheal kits. The silicone balloon is 2-1/4 inches (57mm) in length with an 0.100 inch ID to accept the most popular inflation tubing. The port with the plug has an 0.158 inch ID. The balloons are brightly colored and can be easily distinguished from other components. Additional products, tube components, inflation valves, luer activated checkvalves, connectors, suction ports and syringes can be purchased at Qosina. Call our Customer Service Specialists for assistance regarding obtaining a copy of our 2005 catalog, a sample request or to place an order at +1 (631) 242-3000, fax +1 (631) 242-3230 or e mail info@qosina.com. Custom sourcing service is available through our knowledgeable specialists using Qosina's extensive resources. custom-made OEM disposable components including: stock connectors, luers, caps, clamps, adapters, stopcocks, valves, spikes, syringes and tubing.